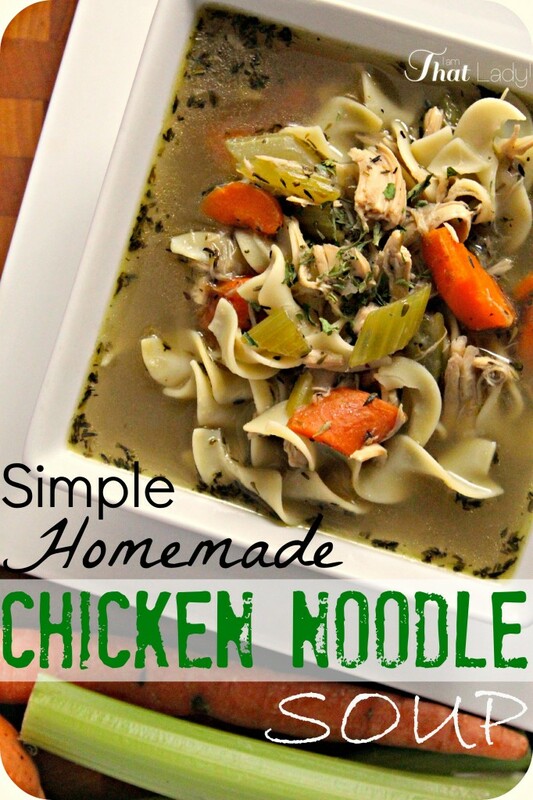 As I'm typing this, tonight is supposed to be the coldest night of this winter – perfect weather for an Easy Chicken Noodle Soup Recipe. My mom always made this growing up, but I never really realized how easy is to make, especially if you've already made the homemade chicken stock recipe ahead of time. I'm not going to say that this recipe will be as good or taste just like Grandma's… I'll actually go one step further and suggest that this will be BETTER than Mom's or Grandma's soup (sorry Mom). Before you start making the soup, I would suggest getting the chicken ready. Remember the chicken that was used to make the stock? 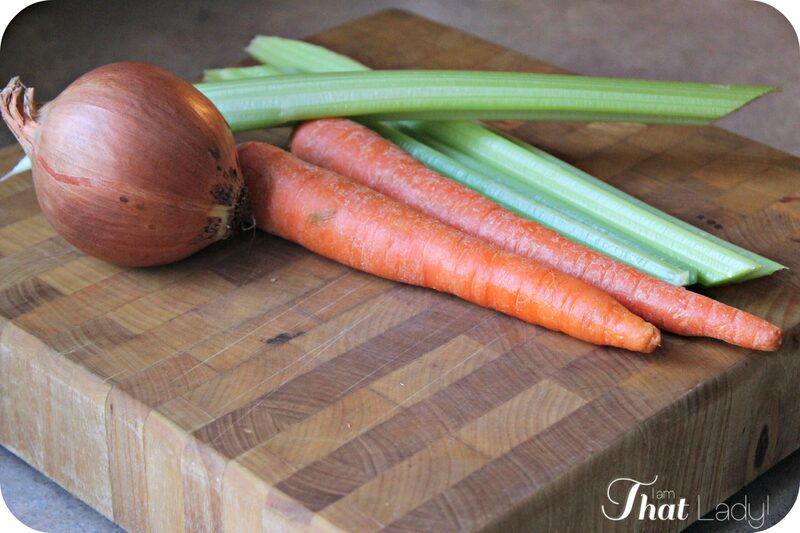 Take it out of the refrigerator and place it on a large cutting board. Since the chicken had boiled for so long when you made the stock, it should be practically falling apart at this point. 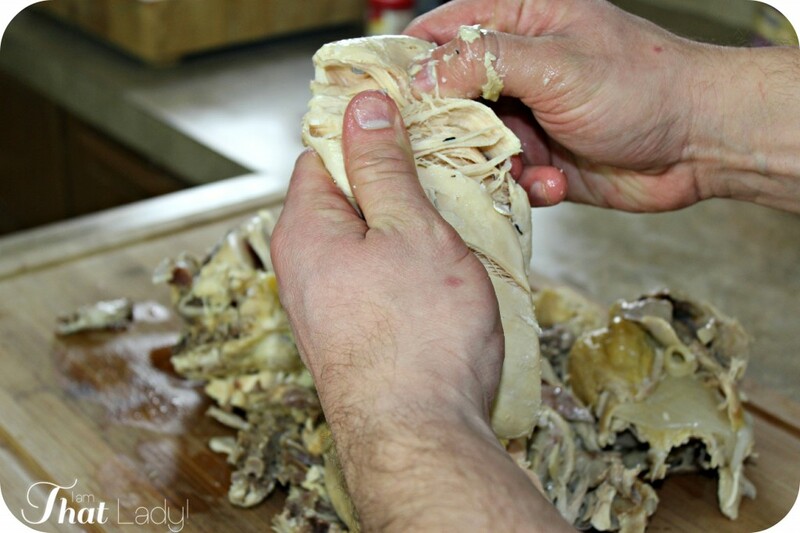 I've found that the easiest way to remove the meat is to just use my hands; it is really easy to just grab whole pieces of the leg, thigh and breast. Tear into small chunks as you remove it, or cut up with a knife. If you prefer to have your chicken shredded, you can shred it in 30 seconds with a KitchenAid mixer using my shredded chicken recipe. 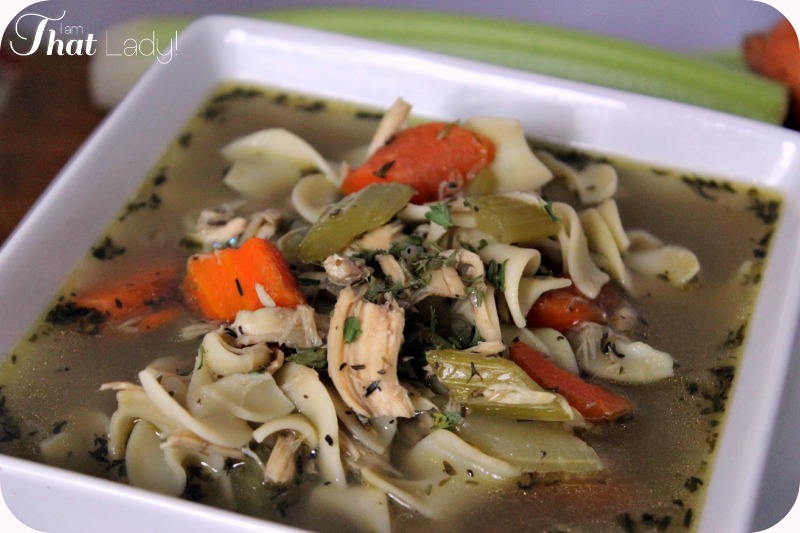 You should have plenty of chicken, easily enough to make 2 pots of this soup with some leftover (great for salads or sandwiches). Now that the chicken is ready, chop the vegetables as noted below and heat a couple tablespoons of olive oil over medium heat. This is where my recipe differs from what my mom used to do. She would simply use the vegetables that were used in the stock, which is fine. But I've found that the vegetables become a bit too mushy after cooking for that long. Instead, I chop new vegetables. I saute in oil with dried thyme for a few minutes; the higher heat definitely intensifies their flavor. Then simply add 2 quarts of chicken stock, 2 cups of chicken, bring to a boil and and simmer on low for about 45 minutes. After that, add the noodles and cook until they are tender. Now for the issue of salt. Some like their soups salty, others don't. Here is what I recommend to get it just right for your taste buds: while the soup is simmering, I add 1 tablespoon of salt. This will give the broth a saltiness similar to a low-sodium soup. I do add more, but I wait until the end. 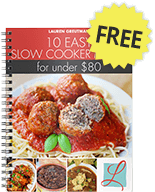 While simmering, a small amount of liquid will boil off and the noodles will also absorb some of the liquid – leaving a slightly saltier little broth. So after the noodles have cooked and the soup is just about ready to serve, taste it. It might be fine at this point for you, but if you feel that it needs more salt, add a teaspoon and mix it in. Then taste again. Repeat until it's just right for you. I usually end up adding 2 teaspoons of salt in addition the first tablespoon. If you accidentally go nuts and add too much, you can always add a bit of water. So here is a printable version of this recipe so you can print it out – or make sure that you PIN it so you can easily find it. 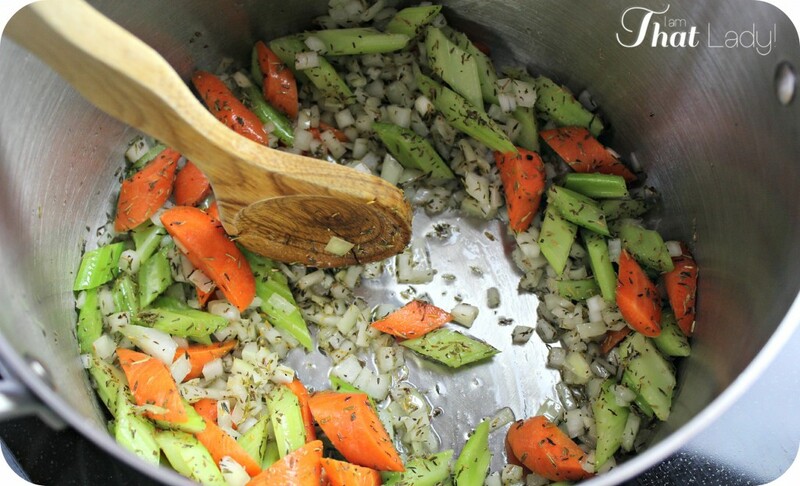 Heat the olive oil over medium heat and add onions, carrots, celery, thyme, pepper and a pinch of kosher salt. Saute for 5 - 6 minutes, stirring often. Add the chicken stock, chicken and 1 Tbsp of kosher salt. Bring to a boil, reduce heat to low and simmer for 45 minutes. Add the egg noodles and cook until the noodles are done. Taste and add additional salt as desired.